December | 2011 | Adventuring Towards . . .
Kim Jong Il is so last week. Kim Jong Il is so last week. Kim Jong Un is the new Kim Jong Il. Kim Jong Un, vice-chairman of the Central Military Commission of the Workers’ Party of Korea, made sure with his loving care on Sunday that a large quantity of sugar was sent to mobile service networks in the wake of taking a measure to provide convenience to the people visiting outdoor mourning stations in grief over the great loss to the nation on a top priority basis under any circumstances. Under this care warm sweet water was served to those at the mourning stations in the capital in greater quantities. The people from all walks of life and school youth and children who visited the stations at Kim Il Sung Square, plazas of the Party Founding Memorial Tower, the April 25 House of Culture and the Pyongyang Indoor Stadium and other places in the capital were deeply moved to receive warm sweet water. He also made sure that hot packs were sent and soya-based drink, honeyed water, various kinds of tea and warm water were provided to people so that they might not feel cold. Not yet feeling assured, he repeatedly took such kind steps. He is such meticulous and tender-hearted man. It is due obligation for the people to visit those stations, ardently missing the nation’s father whom they trusted and followed as Heaven. They revere him as an incarnation of humanity. The loving care repeatedly shown by Kim Jong Un for people when the whole nation is overcome with sorrow will be conveyed to posterity as a legend about love for people. We can only be sad over Kim Jong Il’s death for so long. At some point we have to get back to scavenging grass for food. Stillness has no longer persisted in Pyongyang Saturday morning, a week after the demise of leader Kim Jong Il. Streets, buses and metro are all crowded with people going to their work. They are not giving way simply to sorrow. They are getting over the demise of their leader, promoted by a strong will to closely rally around respected Comrade Kim Jong Un, identical to leader Kim Jong Il in ideology, leadership art and traits, and faithfully uphold his leadership. They are working with redoubled effort. Jo Yong Gil, an employee of the Kim Jong Thae Electric Locomotive Complex, said, "How can I weep away my time, overcome with grief. I will work harder to implement the behests of leader Kim Jong Il." Kim Kyong Su, manager of the complex, said, "We are now bringing about an upsurge in the manufacture and repair of electric locomotives after changing sorrow into strength and courage. All the workshops in the complex are overfulfilling their daily quotas. Our workers will uphold the leadership of Comrade Kim Jong Un with increased production." Workers of the Huichon Precision Machine Plant vowed to step up the work for putting the plant on a modern and scientific basis through a high-pitched drive to push back the frontiers of latest science and technology and bring about uninterrupted miracles and innovations in production and thus successfully carry out the behests of Kim Jong Il. Anti-Japanese revolutionary fighters . . . observed a moment’s silence in memory of Kim Jong Il, great and kind-hearted man who lies in state. They broke into tears, thinking he might just get up, greet them with a broad smile on his face and ask about their health in a resounding voice as he used to. Aside from the excerpt above, there is a change in the tenor of today’s coverage – moving on from “bitterest grief” and “chocking voices” to “determination to carry out at any cost” and “resolve to contribute”. Youths and students of the DPRK have expressed with pure mind their unbounded reverence . . . [and] have unanimously proposed to erect the statue of Kim Jong Il, the benevolent father, with serious repentance of their failure to do so as well as bitter grief at his demise. Meanwhile, many youths and children are vying with each other to show their unsparing sincerity. . .
Young employees at a machine factory in Jagang Province formed a shock brigade with their determination to carry out at any cost the project, entrusted to them by Kim Jong Il, and went to the construction site on Dec. 21 after taking an oath with bitter tears at the mourning place. An increasing number of young people are volunteering to join the shock brigade with their resolve to contribute to completing the construction of the Paektusan Songun Youth Power Station ahead of schedule. . .
Tens of young coal miners at the Anju Area Coal Complex formed a shock brigade and raised the speed of tunneling per day four times the previous one with guilty conscience that they failed to allay the pains taken by Kim Jong Il to solve the problem of coal production. 200 odd youths at the Chonnaeri Cement Plant have waged the production drive without shift since the day when the sad news of his demise was reported. They are now raising the daily production results 1.5 times the previous ones. In the meantime the youths of the Pobdong County Garment Factory are carrying out their daily assignment 250 per cent. And really, it’s no wonder that they’re moved so much by his death, when they believe that he personally and singlehandedly was responsible for the delivery of the fish that they eat. If we gave credit for every bite we ate to the current president, no one would ever defeat an incumbent. While the whole country is seized with grief at the demise of leader Kim Jong Il, Pyongyang citizens are now struck with another story about his loving care for them. . .
Leader Kim Jong Il, who had always been concerned for fish supply to Pyongyang citizens, took a measure for fish supply on the evening of December 16, a day before his demise. Respected Comrade Kim Jong Un, who has been overcome with the deepest grief at his demise, took all necessary measures to truck fresh fish to the capital city in time and supply the fish to the citizens even in the mourning period. Song Hye Yong, a 42-year-old woman living in Pothonggang District, said with a bag full of fish in her hand, "Leader Kim Jong Il is always with us as we have respected Comrade Kim Jong Un identical to him." Kim Jong Hwa, a saleswoman of the Oesong Grocer’s Shop in Central District, said she was much touched by leader Kim Jong Il’s deep care for the supply of fish to people. Also, it might just be me, but I feel like the temperature on the day of his death is getting colder . . . in hindsight. Also, he was walking uphill both ways as he died. "Today I heard that leader Kim Jong Il spent his last days in the severest cold weather in decades. The fact that he devotedly worked for the happiness of our people, though he was out of condition, makes me feel my heart rent. But I will get over my grief and turn out in implementing his behests." The theme for today’s coverage seems to be “hyperbole”. As if previous articles weren’t unbelievably inflated enough . . . The portrait of smiling Kim Jong Il set up at Thongil Street in Pyongyang is being crowded with a lot of mourners day and night. The servicepersons and people who visit the portrait late at nights and early in the mornings are shedding tears picturing leader Kim Jong Il who used to set out on trips for field guidance at dawns getting wet with dew. Kim Yong Suk, 48, woman resident in Raknang District, said if she could give any more sincerity to the benevolent and great father now, she would willingly turn into a rock in funeral dress for hundred, nay thousand days. The plaza of the Party Founding Memorial Tower facing the statue of President Kim Il Sung standing on Mansu Hill is also crowded with people overwhelmed with profound grief over the loss of the father of the nation. The mourners are weeping bitterly, calling leader Kim Jong Il in chocking voices. Looking up to the portrait of smiling Kim Jong Il and then the statue of President Kim Il Sung, they are stamping their feet in bitter grief over the leader’s demise. Chocked with lamentation for three days, not a few people only wept bitterly, unable to say any words. Kim Jong Il was leading the final offensive this year for the improvement of the standard of people’s living, full of energy. He would feel very pleased when watching increased wealth for the people. But who can imagine he breathed his last on the running train on his way of field guidance to bring happiness to them. Can anyone believe this was a reality? How lamentable it is! Isn’t it possible for the hearts of all Koreans to bring him back to life? All the people have revered Kim Jong Il as their father, entrusting all their destinies and soul to him. He was, indeed, the sun of the Korean nation and dearer to them than their own lives. But for this sun, they could not have come close to the eminence of a thriving nation, weathering unprecedented trials and difficulties for 17 years since the demise of President Kim Il Sung. But for this mainstay, they could have hardly got over difficulties and lived and struggled full of confidence of future, faith and optimism. The lamentation of all the servicepersons and people calling him in bitter grief can be heard across the country. The land and sky of the country seem to bitterly cry. They wept bitterly, missing Kim Jong Il very much as he passed away in ordinary jumper while dedicating himself to the happiness of the people. He was the father of the nation as he tirelessly visited every nook and corner of the country with exceptional energy. The servicepersons and the people were confident they would never experience any more misfortune as the greatest loss of President Kim Il Sung. But they suffered such loss in the last days of the year. This was something unimaginable. The clock seemed to stop running and the earth seemed to cease turning round the sun. They broke into the bitterest grief as it was entirely unbelievable. Ri Chun Hui, 52, resident in Central District of Pyongyang, said in a chocking voice that she felt as if her heart would break as he thought Kim Jong Il breathed his last not in his office or residence but on a running train on his way of field guidance. Kim Song Hui, 23, soldier of the Korean People’s Army, said, with tears in her eyes: "Whenever I watched smiling Kim Jong Il over TV, I thought he was in good health. I never imagined he was combating a serious illness caused by the pent-up fatigue. I feel extremely regretful for failing to fulfill my filial duty." Yesterday, I was fixing up my collection of Chinese music on iTunes. (Incidentally, the Android app SoundHound was astonishingly helpful in this, identifying most of my foreign-language songs on the first try!) Anyway, I came across a song titled “我叫小沈阳". 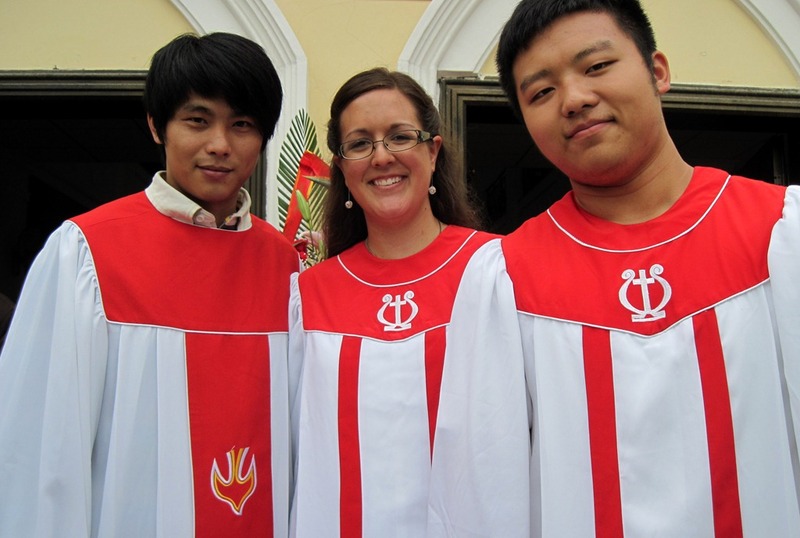 This reminded me of my friend, 小沈, a guy from the Xiamen church choir (on the left). 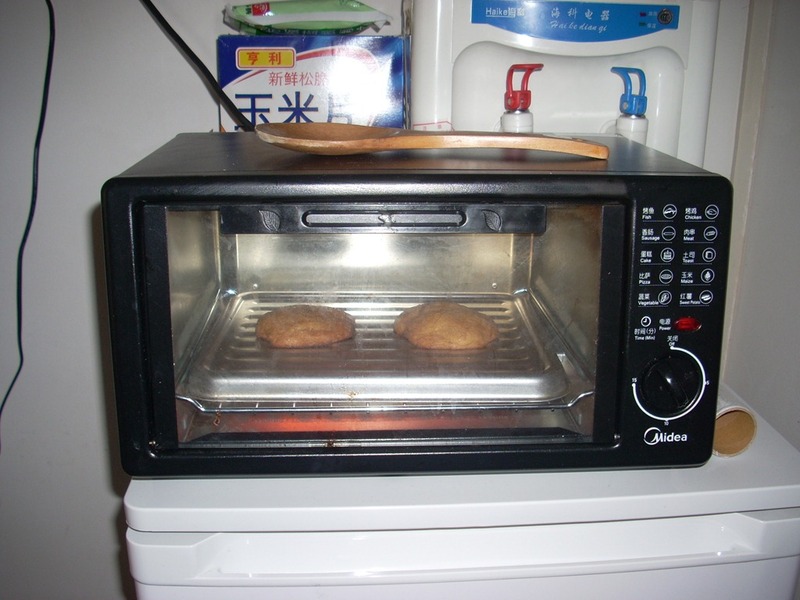 Ah yes, the 300 cookies that I baked four at a time in my roommate’s tiny microwave oven. I brought several batches to Midnight Mass that year to give to all my friends. Of course, I ended up giving them to a LOT of people that I didn’t know, too, which resulted in even more people around church knowing me (as if being the only foreigner wasn’t enough). When I left, there were people crying and shaking my hands and wishing me well who I would have sworn I’d never seen before in my life. So yeah, I knew that the cookies were kind of a big deal, but I had no idea that they would be a prominent Christmas memory for a guy with whom I had had numerous interactions. Of all the shared memories we had, he brought that one up. 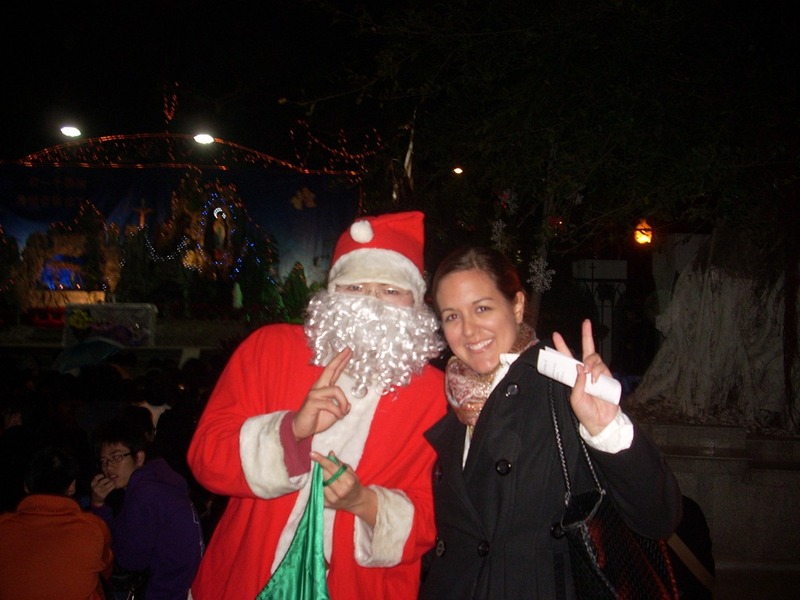 As we continued to reminisce, he brought up another friend, 传鹭, who I had not talked to since I left China (below, dressed as Santa). Clearly I underestimated the importance of a chocolate chip cookie, a mistake I will not make again. Baking for people who don’t own ovens is a powerful thing . . .
Also, please learn how to spell ‘choking’. But, vocabulary aside, they’re coming up with some really compelling stories. Take a look at this – you have never seen a more emotional write-up on the weather. The weather data on the last days of leader Kim Jong Il’s revolutionary activities are moving the hearts of all the Korean people. It was December 16 when the leader set out on the continuous forced march after giving field guidance to the Hana Music Information Center and the Kwangbok Area Supermarket. That day the weather was very cold with fishtail and strong wind. The strength of wind was 5-8 meter per second in most regions of the country, up to 16 meter at maximum in some areas of its northern inland. The temperature at noon was 6-9 degrees centigrade lower than the average, registering the lowest since 1985. Meanwhile in East and West Seas the wind blew 10-15 meter per second, causing the waves to rise up to 2-3 meters. In the morning of Dec. 17 when he was on the train to make a journey of field guidance for the people the temperature was 4-7 degrees centigrade lower than the average, scoring the lowest this winter. Those weather data make one more keenly feel the painful labors of Kim Jong Il who continued in common attire his journey of field guidance with patriotic devotion despite the biting cold weather. Bad days, snowy or rainy, were more frequent than fine and clear days in the course of his long journey for field guidance, weather experts said, stressing that the spring of prosperity under socialism will surely come to the country thanks to the patriotic devotion of Kim Jong Il who blocked the howling wind of history till the last moments of his life. The mourners writhed in the bitter grief at the fact that Kim Jong Il, the great leader of the Workers’ Party of Korea and the people and tender-hearted father, passed away so suddenly and early to their deep regret. They remained long at the mourning places, lamenting with the pricks of the failure to provide the leader even a moment’s rest and with sorrow at his demise. Former anti-Japanese revolutionary fighter Hwang Sun Hui who came to Mansu Hill on a wheelchair grieved over the leader’s demise, her knees on stone steps. She said: "The news was so unbelievable that I felt as if the sky were falling down. "I feel my heart would break. The general passed away all of a sudden not in his office or residence but on a running train about which our people talked in tears, on his way of forced march for field guidance to meet soldiers and people. "I wish I rushed to him and weeped bitterly. I want to stand before your statue, calling you in a chocking voice, but you did not allow us to erect your statue. You never allowed any monument to your exploits to be erected. All Koreans are lamenting over the unexpected demise of leader Kim Jong Il, the great loss to the nation. Among them are officials and employees of the Kwangbok Area Supermarket recently visited by Kim Jong Il. They are throwing themselves into each other’s arms and wailing over his death, saying it was just a few days ago when they saw him full of bean. When Kim Jong Il said he was somewhat relieved to see the modern supermarket, they clung to his sleeves in happiness, they said. We knew that he thought only of people but were not aware of how his health condition had been. How can we be called his soldiers and disciples, they lamented. They said that they could hardly keep back their bitter sorrow, saying it is unbearable for them to think about sufferings he had to undergo, giving the field guidance till the last moments of his life for the happiness of his beloved people. Kim Kyong Suk, 39, who had the honor of being received by Kim Jong Il said, "I hardly imagined he would visit our shop in a cold weather. When he actually came to my counter, I was so happy and made a bow to him. But finding his haggard face, I could hardly hold back tears." Song Su Ryon, 24, a saleswoman of the supermarket, said "I can not believe that he really passed away. I wish that time would turn back so that he can come back to us." Pyongyang, December 20 (KCNA) — People’s wailing voices are rocking heaven and earth in the DPRK after the release of the news that leader Kim Jong Il passed away from sudden illness in the middle of his tour for field guidance. Employees of the Fun Fair of Kaeson Youth Park are bursting into tears, saying they can never forget fatherly General Kim Jong Il who came to the park several times. "When the respected General came here on December 4, an unusually cold day, we asked him to come on a nice day, not a day of such an unfavorable weather, saying there are lots of fine days. Kim Jong Il, with a smile on his face, said people should come on a fine day while he may come on such a bad day," they said. "He passed away leaving behind his promise to come back next spring and watch our art performance. Heaven is so indifferent to us," they added. A poet who wrote the verses of "The blue sky over my country" went to the square relying him on a stick. He, knocking the ground, cried "I can not see the sky. When you were with us, I could see its blue color but today I can not see it at all." Former unconverted long-term prisoners went to the Mansudae Art Studio where they threw themselves before the mosaic portraying President Kim Il Sung and Kim Jong Il. They lamented the demise of Kim Jong Il, saying he passed away so early even though he brought them, who were passing out as breathing fossil, back to his fold and gave happiness so that the whole world could envy them. Looking back on world history, there were many statesmen who advocated patriotism and dedication. But, no one has ever made such total dedication with a pure and true mind like snow. It was only Kim Jong Il who made his life shine like snow. He worked hard day and night, having uncomfortable sleep and taking rice-balls. He was the first to greet dawn like a man in his twenties. Seeing his dedication in tears, the people would ask him to stop making any more journeys along snow-covered roads in cold weather and sitting up all night. Hearing this, he said he considered it as his pleasure and his routine to do so and continued his journeys despite strong wind and snow and spent nights full of enthusiasm. Who is the last laughter? No one in the world can beat the man ready to die. With such pluck and gut Kim Jong Il made trips to inspect the front and give field guidance to factories and co-op farms, providing a bright prospect for building a thriving nation. He made endless journeys for field guidance to make people happy despite snow or rain, sultry summer and intense cold of midwinter. During his field guidance to the February 8 Vinalon Complex he touched white vinalon cotton again and again with pleasure and he visited again in autumn the Ryongjon Fruit Farm and personally tasted an apple in the wake of his visit to it in spring. When visiting a fish farm, he showed loving care as a real father would do, asking in detail how big fish production was this year and where fishes were sent and whether servicepersons and people liked them. Indeed, the people’s happiness was Kim Jong Il’s preoccupation. Leader Kim Jong Il dedicated himself to the happiness of the people all his life. He had a noble wish. It was to bring the greatest happiness and honor to the people even if he had plucked a star from the sky and grown flowers even on a rock. … Watching a shoal of fishes gathering before him at a fish breeding farm, kind-hearted Kim Jong Il said it would be much better, if all of them found their way to people, instead of coming to him. During my summer on the farm in China, I lived about as close to North Korea as one can while not actually living in North Korea. Because of this, I came home with a love of bulgogi, the bragging point of having eaten dog, a collection of Korean stamps, and two issues of the North Korean English-language propaganda newspaper, the Pyongyang Times – it’s like The Onion, only the writers think it’s for real. These papers whetted my appetite, and then I discovered the Korean Central News Agency, where they spew this stuff every day for the reading pleasure of the internet world. I used to check it occasionally for laughs – but you have to be careful because too much propaganda will turn your brain to mush. Mr. Kim is believed to have been born in Siberia in 1941, when his father, Kim Il-sung, was in exile in the Soviet Union. But in North Korea’s official accounts, he was born in 1942, in a cabin, Abe Lincoln-like. The cabin was in a secret camp of anti-Japanese guerrillas his father commanded on Mount Paektu, a holy piece of land in Korean mythology. The event, the official Korean Central News Agency would often say, was accompanied by the appearance of a bright star in the sky and a double-rainbow that touched the earth. Leader Kim Jong Il … suffered an advanced acute myocardial infarction, complicated with a serious heart shock, on train on December 17, Juche 100 (2011) for a great mental and physical strain caused by his uninterrupted field guidance tour for the building of a thriving nation. Every possible first-aid measure was taken immediately but he passed away at 08:30 on December 17. An autopsy on December 18 fully confirmed the diagnosis of his diseases. Kim Jong Il, general secretary of the Workers’ Party of Korea, chairman of the National Defence Commission of the DPRK and supreme commander of the Korean People’s Army . . . genius of the revolution and construction . . . supreme incarnation of the revolutionary moral obligation . . . great master of politics and illustrious commander born of Heaven . . . father of the nation and lodestar of national reunification . . . great guardian of socialism and justice . . . great revolutionary who covered an untrodden thorny path with his iron will and superhuman energy . . . peerless patriot. The whole country was shocked to hear the news that leader Kim Jong Il passed away of a sudden disease on train while making his indefatigable efforts for the prosperity of the country and its people’s happiness. The sad news of the loss of the father of the nation was so unbelievable for the Korean people that they call his name again and again in chocking voices. Considering it as his maxim to believe in the people as in Heaven, he worked heart and soul day and night, without having any good rest, prompted by his desire to enable the Korean people to become the most dignified happy people in the world. He did just the way the President did as he always traveled a lot to mix with the people. Visiting every corner and nook, remote mountainous villages or isolated islets where people live, he unraveled their knotty problems with his loving care as their real father would do. Having a short and uncomfortable sleep and taking a rice ball as his meal, he made ceaseless efforts to bring the day of prosperity when the people will have no more to desire in the world. "General has not passed away." These are the voices of grief heard from among all Pyongyangites, young and old, men and women, at the sad news of demise of leader Kim Jong Il which came like a bolt from the blue. The … mosaics depicting Kim Jong Il are visited by an endless crowd of citizens. They are shedding bitter tears, their knees on the ground, as they courageously weathered out stern adversities, trusting him only and holding him in high esteem as the sun of destiny and father. They are getting the paved stones drenched with tears, feeling so regrettable as they can no longer see him whose smile was as broad as sunshine. An endless stream of soldiers, working people and school youth and students visited the statues of President Kim Il Sung and mosaics depicting the peerlessly great persons to express their bitter grief though it was past 12 at night. Anti-Japanese revolutionary fighter Hwang Sun Hui, who came by a tricycle, grieved over the demise of Kim Jong Il, her knees on the stone stairway. . .
Former unconverted long-term prisoners, too, could not stand to their feet, grieving over his demise before the mosaic at the Mansudae Art Studio. On the first Sunday of Advent this year (the end of November), American Catholics started using a new translation of the Mass. The changes are relatively small, but when they’re changes to something you know as well as the Mass, they throw people off. So here I am, two years after mastering the Mass in Chinese, and I found myself again clinging to a sheet of paper, reading along with responses that need to be memorized, silently chastising myself when I respond the old way and rejoicing when I nail the new translation. Brings back some strong memories. I remember how, with each passing week, I knew more and more of the words. At first I had the pronunciation written in, then just the characters, then I stopped needing a booklet at all. And I remember how proud I was when I first successfully said the “望上主从你的手中…” part by myself. Although I’m pretty good now, the first few weeks were harder (just like in China). I think part of me wondered if the Chinese Mass would be easier for me to participate in than the new English translation . . . and I had heard of a Chinese church in the city (San Francisco) so I decided to check it out. In a situation a little bit too reminiscent of my Chinese [mis]adventures for my comfort, the Mass ended up to be in Cantonese instead of Mandarin. That’s kind of a big deal, as one is a dialect I speak and the other is not. It ended up being more like my very first weeks in Xiamen, when all I understood was the homonyms for Jesus, Mary, Amen, and alleluia. On the plus side, I’ve now been to Mass in 10 languages (English, Spanish, Latin, Italian, Polish, Mandarin, Cantonese, Min, Korean, and Khmer)? This week, safely past Gaudete Sunday and into finals, I finally started listening to Christmas music. My Christmas music collection includes lots of classics as well as music from past holiday concerts that I participated in during my band years, and one in particular stood out to me this year. Te lai wei jiu shi shang ren. Jiang shi wei jiu wo, jiu ni! And then I was even more confused. This is one of the first times I’ve ever seen a bunch of pinyin that I didn’t already know the characters to, and it is striking how ambiguous this text is. The first line is pretty easy – “Listen, friend, to this good news” – and I understand on the first read-through. But in the second line, I find myself wondering, Jesus did what to save you? ‘Jiang’ can be 将, 讲, 降, and those are only the verbs that I know of that might possibly fit in this context. After a little bit of thought, I thought the line was 耶稣降世为救你. But, even more interestingly, I was really confident that the ‘shi’ was “to be” (是), but Google pinyin seemed pretty confident that it was “earth” (世), which would turn the meaning from “[The reason] Jesus came down is to save you” to “Jesus came down to earth to save you”. Line 3 is also easy – 本来他是天上神, or “Originally he was a God in Heaven”, but line 4 causes at least a double-take. The first time I heard it, I thought it was 他来为就是伤人, or “[The reason] he came is for the injured” but then again, maybe they meant 他来为救世上人, or “He came to save the people on earth”. Well anyway, I still like the song and its message. Or messages. Or whatever.